2016 Funko Gears of War Mystery Minis largely reflect their corresponding Pop! vinyl figures. 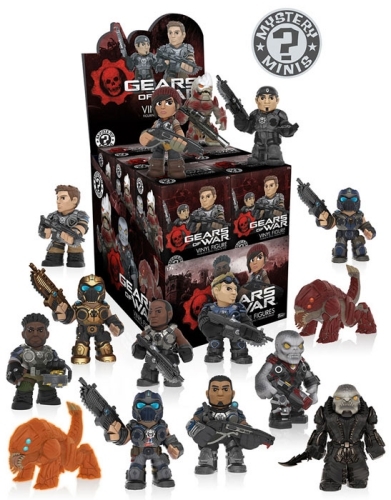 Focusing on the GoW franchise, the minis also include Gears of War 4 figures not currently found in larger Pop sizes. Since the initial release of Gears of War (GoW) in 2006, the third-person action/horror video game has spawned a total of five installments (yes, I’m including Gears of War: Judgment). With the exception of Judgment, gamers play as Marcus Fenix, a former war hero looking for redemption after abandoning his post to protect his father. Throughout the action-packed, emotional, yet sometimes very comical gameplay, gamers come to know the memorable members of Delta Squad. Sticking to the typical minis format, the Funko Gears of War Mystery Minis figures are issued by the case in a blind-box format. Helping to ensure the contents remain a secret, every box containing the miniature figure is packaged the same. With only 15 minis to collect, as no announcement for any exclusives has been released at this time, there is a greater chance to find and collect the entire set more easily. However, given that just 12 figures come in a case, collectors will need more than one case to find them all. The specific odds for Funko Pop Gears of War Mystery Minis are listed below.